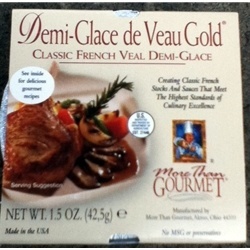 Demi Glace De Veau Gold offers a refreshing change from the standard Escoffier recipe and is ideal for today's modern contemporary kitchen. It has a more sweet veal taste, with hints of meat and mushroom, than our classic Demi-Glace Gold's complex traditional taste and flavor profile. Now you can choose the profile that fits your cooking style.